Dr. Polsky provides analysis of a dog bite lawsuit in Arizona in which he was retained as a dog bite expert. Expert analysis became necessary because of the uncertainty about which dog or dogs were involved in the incident. Animal behavior analysis was used to reconstruct incident for the purpose of determining which dog bit the plaintiff and the liability of the defendant dog owner. The plaintiff set out on her routine evening walk with her dog, a 10 y.o., male border collie mix dog, named Brisco. She had regularly taken this walk with her dog on many occasions using same route for many years. During her walk with Brisco she passed properties which contained dogs behind fences, and occasionally Brisco would “fence fight” with some of these dogs. During this particular walk, the plaintiff states that she had a leash attached to the collar of Brisco. Towards the end of the walk, as she was heading home, she passed in front of the defendant’s property and noticed that the defendant’s dog, a 4-year-old pit bull mix named Dumbo, was moving rapidly towards her. Dumbo had escaped from the defendant’s property. The plaintiff Immediately became concerned about the possibility of a fight starting between these dogs because they had fought one another on a previous occasion. The plaintiff attempted to move away from Dumbo, by pulling Brisco with the leash that was attached to his neck collar. Nevertheless, a fight ensued between Dumbo and Brisco, which according to witness statements lasted about 2 minutes. At some point during the fight the plaintiff testified that Dumbo was on her right side, and she pushed him forward with her right arm. Immediately after being pushed forward, Dumbo fixated on the plaintiff, then lunged at her and latched onto her outside right forearm. She states that the dog would not let go of her arm. At some point during the fight between the dogs, the plaintiff testified that the collar around Brisco’s neck broke. The plaintiff testified that she subsequently fell to the ground when neighbors arrived to assist. Neighbors arrived because they heard her screaming. Parts of the plaintiff’s version differed from the accounts given by witnesses who observed portions of the incident. One witness states that she noticed that the plaintiff restraining her dog by the collar while the dogs were fighting. This witness instructed the plaintiff to let go of Brisco’s collar. This witness nor another witness who arrived on the scene about the same time did not see which dog inflicted the bite to the plaintiff. Both witnesses placed Brisco on the right side of the plaintiff. A third witness arrived on the scene, and attempted to stop the fight by striking Dumbo with the leash as he was circling Brisco. Shortly thereafter, the defendant and another neighbor arrived. This neighbor dragged Brisco back to his home without incident, and the defendant yelled at his dog, and Dumbo squatted and ran back home. The plaintiff sued the defendant on the basis of strict liability as specified in Arizona’s dog bite statute. Discovery was gleaned from the following sources: (a) Behavioral observations of the witnesses gleaned from deposition testimony and telephone interviews; (b) Historical information about each dog’s past behavioral tendencies gleaned from deposition testimony and telephone interviews; (c) Behavioral information about the dogs gleaned from veterinary charts, police and animal control reports. Supplemental evidence included: photographs of the bite injury to the plaintiff’s right forearm; Photographs of the dogs and the location where the incident happened; Medical records for the plaintiff documenting her injuries. The defense became suspect of the plaintiff’s testimony, and questioned whether the defendant’s dog was the one that inflicted the bite. Animal behavior analysis was used to reconstruct the incident to determine which dog bit the plaintiff. First, witness testimony was consistent in that they observed Brisco on the right side of the plaintiff while she was restraining him by his collar with her right hand. Brisco’s collar broke, most likely because of the force being applied to the collar by the plaintiff in her effort to keep the dogs apart. The collar snapped at its weakest point, the plastic coupling. Once the collar broke, Brisco head was afforded more movement, and it was proximate to the plaintiff’s outside right forearm. Therefore, Brisco was properly positioned to bite the plaintiff’s outside right arm. The plaintiff testified that she pushed Dumbo forward with her right hand. Therefore, Dumbo was not properly positioned to inflict a bite to her outside right forearm. The expected contact point for a bite from Dumbo would have been on the plaintiff’s inside right forearm, and not the outside. 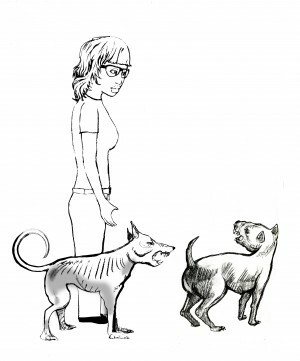 This sketch shows the position of the dogs immediately before the plaintiff was attacked. Moreover, other evidence points to the conclusion that Brisco was the dog who inflicted the bite. For example, during a dog fight, a dog might turn and bite a person who was restraining it. In this instance, the plaintiff was restraining Brisco. The target of a dog’s aggressive response may become redirected to a human if the dog is interfered with while in an aggressive motivational state, as was the case in this situation. Generally speaking, during a dog fight, both dogs are focused on one another as a target to attack. If a person attempts to thwart a dog’s aggressive response towards a primary target, that is the other dog, then this may be sufficient cause sufficient cause for one of the dogs to redirect its aggression towards the person attempting intervention. In fact, as previously noted, the force of this restraint imposed by the plaintiff by holding the collar of Brisco, was sufficient to cause the collar to break. In contrast, there was no significant restraint imposed on Dumbo. Since Dumbo was under no restraint, motivationally there would have been no reason for him redirect his aggression to the plaintiff. He undoubtedly was focused on fighting with Brisco, and the push by the plaintiff with her right hand onto the hindquarters of Dumbo could not have been done with sufficient force to deter his focus on Brisco, and redirect his aggression to the plaintiff. In fact, in some instances, when pit bull type dogs are in the midst of an intense dog fight, often it takes great physical force to deter the dog away from the dog it is fighting. Moreover, on a previous occasion, Brisco and Dumbo fought with one another. The person who broke up the fight states that he also pushed Dumbo twice during the fight, in an attempt to stop the fight, and this did not cause Dumbo to redirect his aggression to him. Last, the plaintiff may have inadvertently inserted her arm between the two fighting dogs. However, the plaintiff testified that she was not bitten in this manner. In dog bite cases like this, discovery that could potentially be used determine which dog inflicted the dog bite include: (a) taking dental impressions of the suspect dog(s) and comparing the impression to the victim’s wounds; (b) DNA analysis from blood, hair, saliva, or fibers for the purpose of matching this evidence to the victim or dog. These techniques could not be done because the investigation into this case did not start until about a year after the incident happened. The plaintiff was the only witness who observed the dog inflict the bite. Her testimony was suspect, however. Given this uncertainty and the absence of other potentially useful discovery, reconstruction of the incident was needed using animal behavior analysis. Note here, no direct behavioral examination of the dogs were undertaken. In some dog bite cases, when appropriate, it might be beneficial to have a dog’s temperament evaluated and behavior assessed to determine if the dog possess the tendencies to engage in the kind of behavior that caused injury to the plaintiff. Frequently this cannot be done because the dog has died or, because one party refuses to allow inspection of the dog. However, depending on the facts of the case and the quality of discovery available, examination of the dog may not add new information, or it will confirm what has already been established. Last, this analysis could not have been completed without behavioral descriptions gleaned from witnesses and the plaintiff. 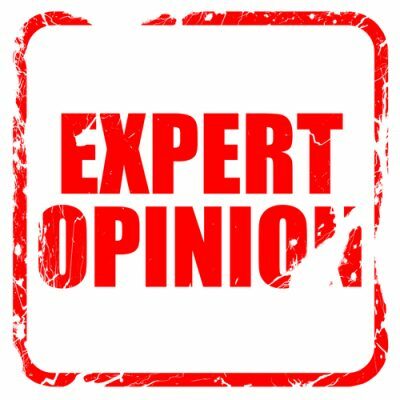 Whether the testimony of the witnesses other than the plaintiff were biased is a possibility, but unlikely, because all witness accounts of the incident were consistent with one another.